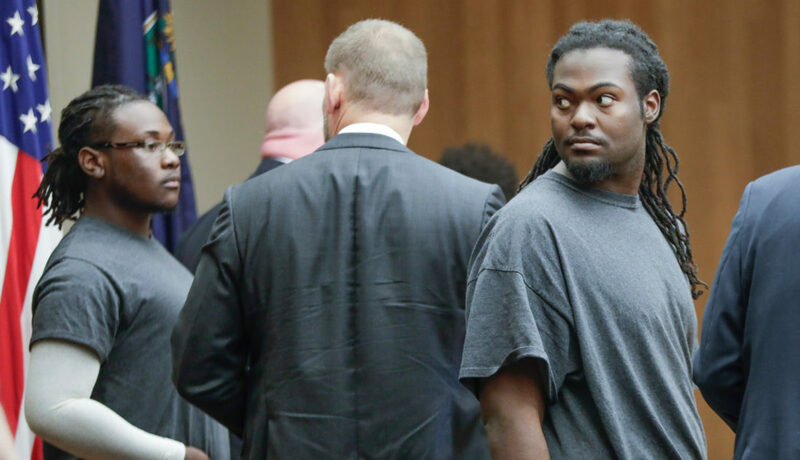 Ramone Singleton, right, turns to look at the gallery at the end of a preliminary hearing on Tuesday, Nov. 21, 2017, in Douglas County District Court. 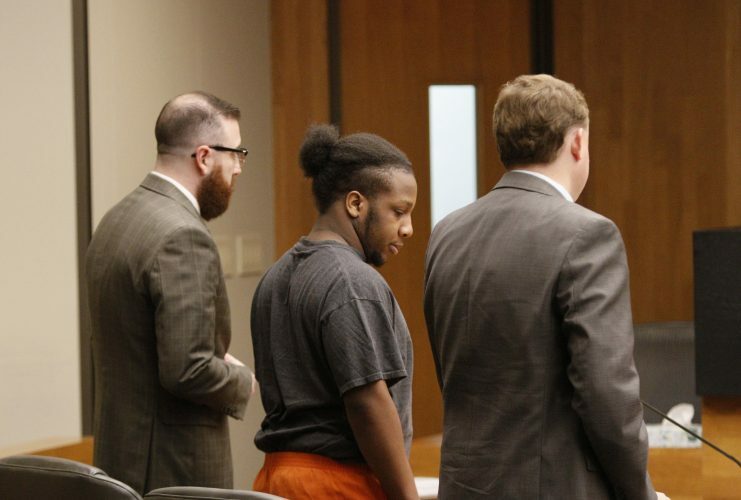 Singleton is one of three men charged with murder and other crimes in connection with a Sept. 2, 2017, shooting at the North Lawrence Motel 6. Also pictured, at left, is co-defendant Tyrone J. Carvin with his appointed defense attorney, Michael Clarke, center. After a two-day selection process requiring an overflow courtroom and extra court clerk staff to accommodate a group of about 140 potential jurors, on Tuesday night a full jury was picked to hear the Motel 6 murder case. The jury comprises nine women and three men, plus two alternates. They were sworn in about 6:30 p.m. 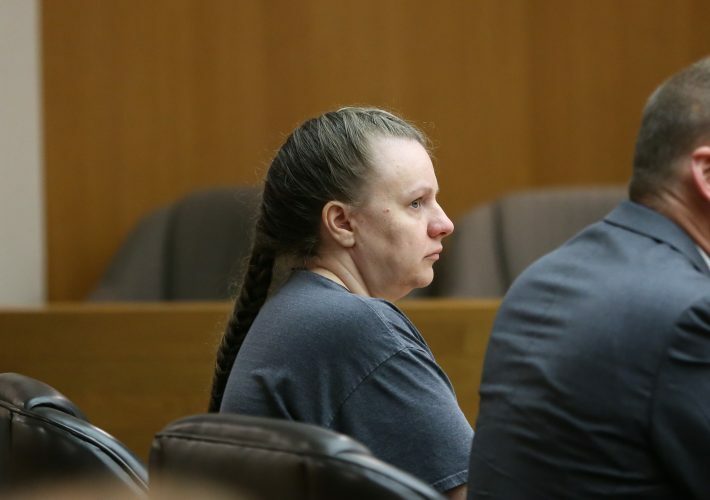 Opening arguments and testimony in the case will begin Wednesday morning before Judge Sally Pokorny in Douglas County District Court. The two-week trial — unusual in part because there are three defendants — is scheduled to last until Aug. 24. Tyrone J. Carvin, 19, of Kansas City, Kan.; Ramone Singleton, 23, of Kansas City, Kan.; and Shawn K. Smith, 19, of Kansas City, Mo., are each charged with first-degree felony murder, for allegedly killing a man during the commission or attempted commission of an armed robbery; aggravated battery; aggravated assault; and attempted armed robbery. 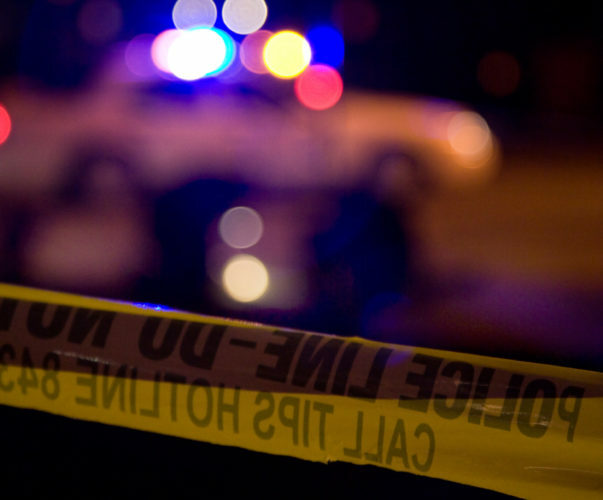 The case stems from a fatal shooting that occurred about 11:30 p.m. Sept. 2, 2017, inside Room 308 of the North Lawrence Motel 6, 1130 N. Third St. A group of nine men had been partying in the room when gunfire erupted, killing 23-year-old Cameron Hooks, of Lenexa, and injuring two men from Topeka. 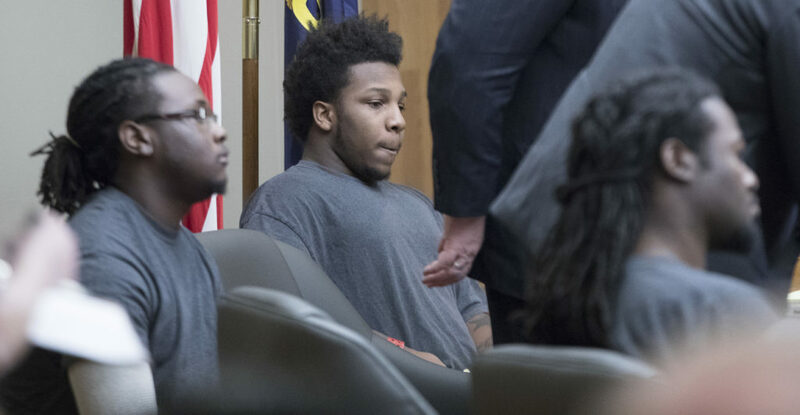 Charges and previous testimony allege that the three co-defendants and a fourth suspect — who hasn’t been publicly named or charged — suddenly got up from different locations in the room and started firing while trying to rob other men they’d been hanging out with. The defendants, though appearing in court for the trial in street clothes, remain jailed on $1 million bond. Carvin is represented by Michael Clarke, Smith by Gary Long and Singleton by Forrest Lowry. All three defendants are black. So was Hooks, the man who was killed. The jurors and alternates all are white. In the group of 140 potential jurors called in to be considered for the case, people of color accounted for just a handful — a reporter observed three who were visibly black or brown-skinned. Race was among lines of questioning during the jury selection process, by one defense attorney. Clarke’s questions included asking potential jurors their first impressions of his client, Carvin, noting that he was black and wore his hair in braids. Clarke also asked about potential jurors’ associations with people in minority groups. Several said they were married to or in relationships with black men, and others said they had other relatives of color. It’s unclear whether any of the jurors ultimately picked were among those — with no extra seats in the main courtroom, a reporter seated in the overflow courtroom was unable to see jurors during questioning. During his questions, prosecutor Mark Simpson explored potential jurors’ comfort level with the concept of felony murder, the state law that says defendants can be convicted of murder without proving that they personally killed someone but by proving that they committed an inherently dangerous felony during which a homicide occurred. Simpson also asked jurors whether they could be open-minded about another unusual issue expected to arise in this case: testimony from witnesses who aren’t actually going to be here. Two of the four known eyewitnesses who survived the shootout can’t be found by the district attorney’s office. Instead of those men taking the stand, their previous court testimony will be read aloud by someone from the DA’s office, as the judge agreed to at a pretrial hearing. 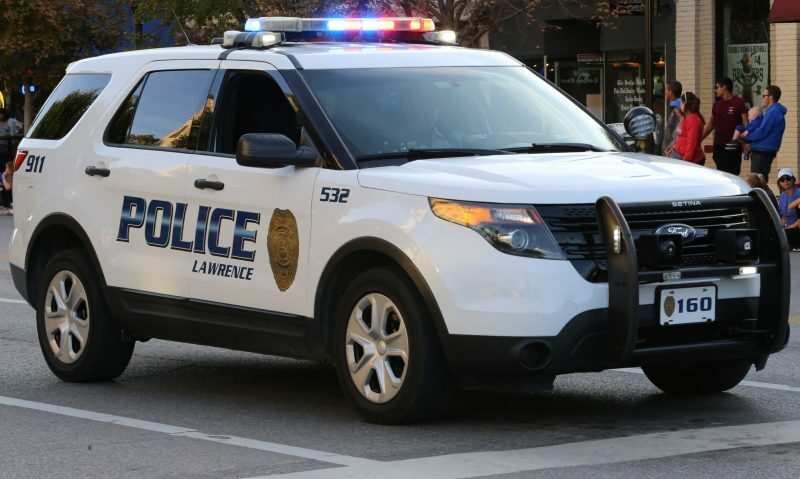 A friend of alleged aggravated assault victim Tanner Marlow and alleged attempted aggravated robbery victim Mathdaniel Squirrel told authorities the men were scared, in part because vehicles followed them home to Topeka after they testified at a preliminary hearing in Lawrence in November, according to pretrial testimony. Marlow’s father filed a missing person report with Topeka police in April, saying in the report he thought his son had been killed. Squirrel’s ex-girlfriends, relatives, bondsman and law enforcement authorities in multiple cities have told local authorities they don’t know where he is.